Few cars over the past two decades have caused such a stir in the industry than Chrysler’s 300C. First shown in 2003 at the New York Motor Show, Chrysler knew the 300C would be a sure-fire hit, and then they announced the pricing, and the world collectively opened their mouths in shock. 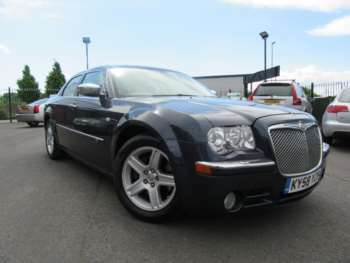 It’s true, Chrysler did well with the design of the 300C and the pricing – which started at just £27,000 for the basic model – was quite frankly ridiculous, but it wasn’t quite enough. Even those who were originally fooled for thinking it was a Bentley were put off when they got inside and saw that it just wasn’t up to European standard. Chrysler had the chance to make a properly quality product, and then they built it out of awful components and garnished it with typical American luxury car shiny wood and soft leather. It just didn’t work. There are a couple models to choose from, but the pick of the bunch is probably the Hemi 5.7-litre V8. Yes, a V8 in this climate is ridiculous, but this is a Hemi and it’s very clever. At low speeds, the V8 runs on just four-cylinders, meaning you get relatively respectable MPG figures, then, when the mood takes you, all eight fires up and you’re away. Thanks to Chrysler’s list price of the 300C being so low, used car prices are now so low it’s almost stupid. You can, even if you think you can’t, probably afford the aforementioned Hemi version. The 300C is a massive car, inside and out. So, if you want a saloon that’s not only affordable but huge, the 300 is your motor. Just be careful not to expect European-levels of luxury, engineering and build quality, because the 300C is just not even close to BMWs or Audis. 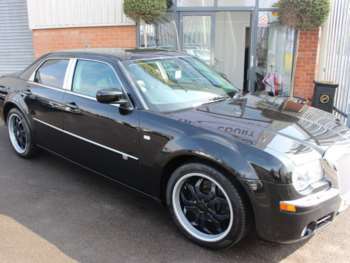 As we’ve said, the 300C started new at just £27,000, so used prices are now fantastically low. The STR-8 425bhp version is still in demand, so expect to pay handsomely for the privilege of owning that model, but for the rest of the range, you’re laughing. Prices will range from about £13,000 to £20,000, and for what you get, it’s a bargain on anyone’s budget. There’s a hell of a lot of leather in the 300C, so basic checks of all the upholstery is a good idea. The Americans aren’t famed for their build quality, so just make sure everything works as it should. Thankfully, the 300C shares the same basic platform as the Mercedes-Benz E-Class, so in theory, you should be ok.
£175 for a clutch assembly, while a starter motor will be about £195 and a radiator sits at around £175. A full exhaust is about £880, and brake pads front and rear are about £70. The 300C is a typical muscle car in any sense of the word. It’s brilliant on the straights and very poor through the bends. Put it into a corner and all you get is a million miles of understeer and more roll than a pallet of Swiss Roll desserts. The V8 versions are impressively quick in a straight-line, just be careful not to push them too hard round corners, as you will fail. The steering wheel is huge, the suspension is softer than Babybell cheese and the damping will make your children sick, but if all you require from a saloon is presence and power, you’d be hard pressed to find a cheaper candidate with more toys and tech. It’s a good car in some aspects and a bad car in lots of others. Got a specific Chrysler 300C model in mind?